You’d think that working at a pizza place for five years would have burned me out on pizza. Or going to school in the land of deep dish pies. Or having one of the single.most.amazing pizza restaurants just two blocks away from my apartment. But no. I still can’t and don’t get enough of it. But, I don’t just want the standard cheese and sauce anymore. 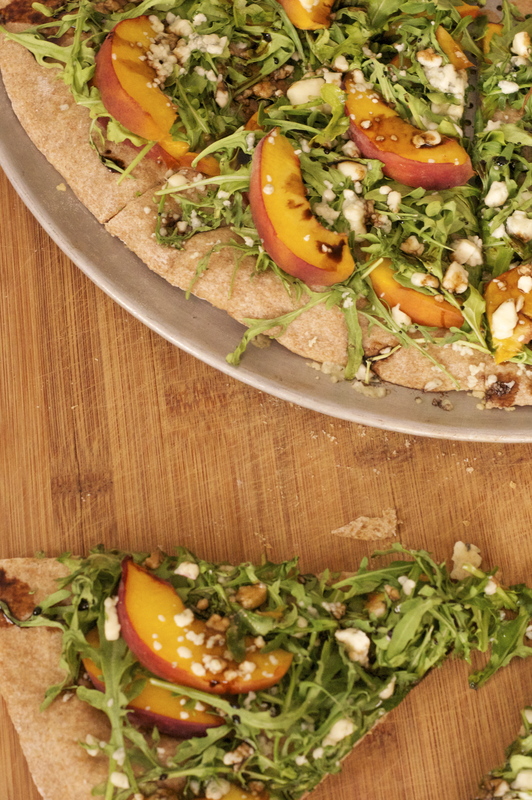 I need flavor, I need texture, I need…well…I need more of this pizza. It’s fruity and sweet, but substanstial and filling. 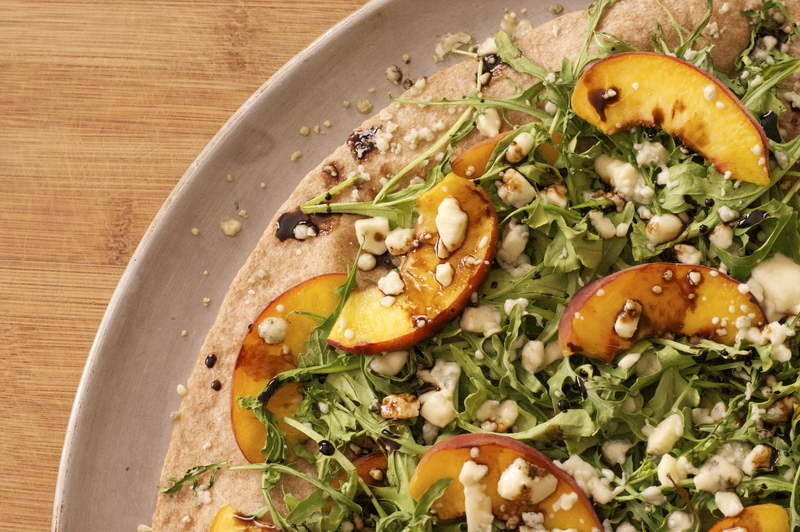 It’s got a small bite of peppery flavor from the arugula and a salty kick from crumbled gorgonzola. Plus a whole other layer of flavor from the balsamic reduction drizzled over top at the end! Swoon! It’s like summer. But pizza. I cut corners here by using a store-bought whole wheat crust, feel free to use homemade if you’ve got the skill or patience (I have neither). It’s summer, I can’t wait for dough to rise. Not when I need pizza. And you need this pizza. Now. Preheat oven to 400 degrees. On a floured surface, roll out dough to a 1/8 inch thick circle (mine was about 16 inches around) and place on pizza pan. Alternatively, if you don’t have a round pan, you can use a square pan and simply press the dough into it. Drizzle olive oil over prepared crust and bake for 10 – 12 minutes, or until edges begin to brown. Pop any wayward bubbles with a knife to release steam. 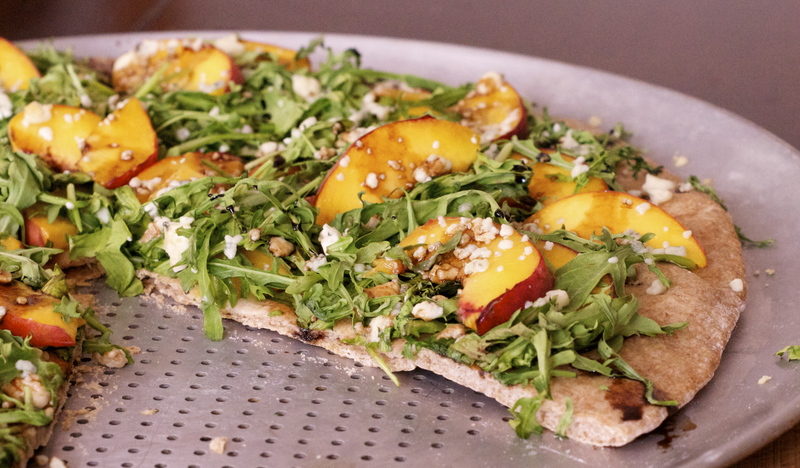 Top partially baked crust with half of the sliced peaches, a layer of arugula, the remaining peaches and sprinkle with gorgonzola. 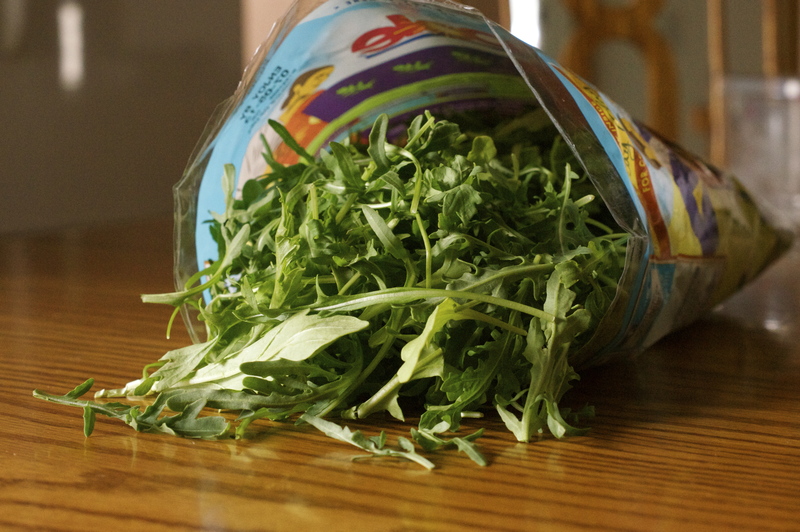 Return to oven for an additional 5 – 7 minutes, or until cheese has just begun to melt and arugula is wilted. Drizzle with balsamic reduction and slice into 8 equal pieces. Serve immediately. Pour 1 cup of balsamic vinegar into a small saucepan and place over medium-high heat. Bring to a boil and then reduce heat, allow to simmer for 15 – 20 minutes, or until liquid has reduced by over half. I’m such a big fan of pizza! This sounds like such a wonderful and different combination of flavors. I love it! Thank you! Give it a try, you won’t be disappointed!